Omarosa Manigault, President Donald Trump's Director of Communications for the Office of Public Liaison, was present for the White House press briefing in the James S. Brady Press Briefing Room of the White House, on Monday, June 5, 2017. Omarosa Manigault Newman, the former reality TV star who became a top White House aide to President Donald Trump, on Thursday released exclusively to MSNBC a secret tape of campaign official Lara Trump offering her a $15,000-a-month job after her she was fired from the administration. 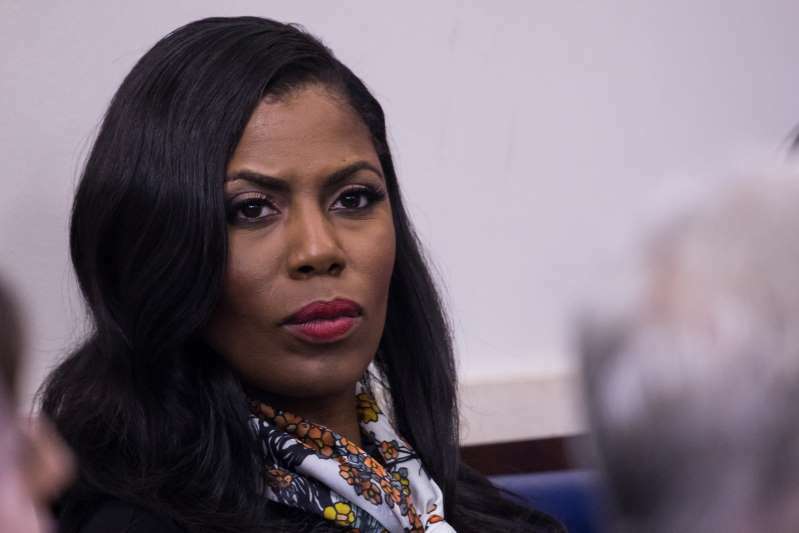 The tape — which, according to Manigault Newman was made on December 16, 2017, just days after she left her White House job — appears to corroborate claims she made in her new book about receiving an offer from the president's re-election campaign. Manigault Newman wrote in her book that the job offer came with the condition of signing a non-disclosure agreement; she said she did not accept it. [post_ads]On the new tape, Lara Trump says, "It sounds a little like, obviously, that there are some things you've got in the back pocket to pull out. Clearly, if you come on board the campaign, like, we can't have, we got to," she continues, before Manigault Newman interjects, "Oh, God no." "Everything, everybody, positive, right?" Trump continues. In an interview with MSNBC's Craig Melvin following the airing of the excerpts, Manigault Newman said the recording was proof of "an attempt" by the Trump team "to buy my silence, to censor me, and to pay me off." Asked by Melvin if she saw it as "hush money," Manigault Newman responded, "Absolutely." Manigault Newman shared four excerpts from the recording of the longer conversation for broadcast; NBC News has heard the full tape of the conversation and the clips are in context. NBC News has contacted the Trump campaign for comment. In another excerpt of the recording, Lara Trump, who is married to Donald Trump's son Eric, is heard explaining to Manigault Newman that "the only thing that we have to consider, where we're talking salary as far as the campaign is concerned, is that, as you know, everything is public." "And that all the money that we raise and that pays salaries is directly from donors, small-dollar donors for the most part. So, I know you, you were making 179 at the White House. And I think we can work something out where we keep you right along those lines," Trump continues. "Specifically, let me see, I haven't even added up the numbers. But we were talking about, like, 15K a month. Let me see what that adds up to. Times 12. Yeah." "So that's $180,000. Does that sound like a fair deal for you?" Trump is heard saying. In another excerpt, Trump says the job would require Manigault Newman to be flexible about where she is working, pointing out that she would have to come to New York occasionally, but could remain in Washington, D.C., if she wanted to, and might be asked to do speaking engagements for the campaign. The latest secret audio recording — the fourth one Manigault Newman has released in recent days — comes after the release this week of her book, "Unhinged: An Insider's Account of the Trump White House," in which she slammed the president as racist and in mental decline. Trump has repeatedly insulted Manigault Newman in the days since her media blitz began, calling her "wacky," "vicious but not smart,"a "dog," and someone who “constantly missed work.” White House Press Secretary Sarah Huckabee Sanders has called Manigault Newman a "disgruntled former" employee whose book was simply an effort to profit off "false attacks." Since last weekend, Manigault Newman has also publicly shared audio recordings made in the White House of Trump and of chief of staff John Kelly, as well as one of what she said was a phone call between herself and several other Trump advisers.